ADAM CRINSON IS A SCENIC DESIGNER FOR THEATER, OPERA, AND DANCE. HE CURRENTLY RESIDES IN NEW YORK CITY WORKING PRIMARILY AS A FREELANCE ARTIST. ADAM HAS NOW DESIGNED SCENERY AND COLLABORATED ON OVER 100 PRODUCTIONS WITH COMPANIES ACROSS THE UNITED STATES. ADAM BEGAN HIS CAREER AS A DESIGNER IN 2008 IN METRO DETROIT. HE SERVED AS THE TECHNICAL DIRECTOR WITH THE JEWISH ENSEMBLE THEATRE FROM 2011-2013 WHILE ALSO COLLABORATING AND DESIGNING PRODUCTIONS WITH THE RINGWALD, MATRIX THEATRE CO., ARTXDETROIT, MICHIGAN OPERA THEATRE AND WAYNE STATE UNIVERSITY. IN THE SPRING OF 2013 ADAM MOVED TO CHICAGO TO CONTINUE AND ADVANCE HIS WORK IN THE DESIGN FIELD. IN THE TWO YEARS THAT HE SPENT IN CHICAGO ADAM WORKED WITH SUCH COMPANIES AS SUGAR CREEK OPERA, PEGASUS THEATRE CO., TEATRO VISTA, BRAVO!, AND LYRIC OPERA OF CHICAGO. ADAM MOVED TO NEW YORK CITY FOLLOWING HIS FIFTH CONSECUTIVE SEASON WITH DES MOINES METRO OPERA. 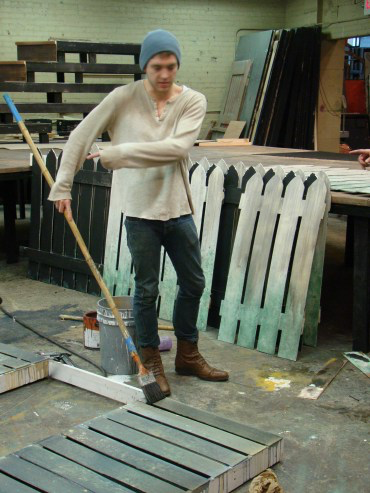 HE BEGAN WORKING WITH THEM IN 2012 AS PROPS MASTER AND TRANSITIONED INTO THE ROLE OF ASSISTANT SCENIC DESIGNER IN 2014, WHILE ALSO SERVING AS SCENIC DESIGNER ON THEIR SECOND STAGES SERIES. THIS SUMMER HE WILL RETURN AS THE ASSISTANT SCENIC DESIGNER ON CANDIDE, WOZZECK, AND LA BOHEME WHILE ALSO SERVING AS THE SCENIC DESIGNER FOR THE 2ND STAGE'S PRODUCTION OF BON APPETIT FEATURING JOYCE CASTLE AS JULIA CHILD. IN JANUARY OF 2017 ADAM COLLABORATED WITH KRISTINE MCINTYRE AND KATHY MAXWELL ON AN IMMERSIVE PRODUCTION OF DAVID T. LITTLE's OPERA SOLDIER SONGS. A BRAND NEW PRODUCTION AT A LIVE MILITARY POST, CAMP DODGE IOWA ALLOWED DES MOINES METRO OPERA TO TRANSFORM ONE OF THEIR HALLS AND EVEN CONTRIBUTED TWO HUMVEE's FOR SET DRESSING AND ADDED EFFECT. IN OCTOBER OF 2018 THE SAME TEAM REUNITED TO COLLABORATE ON AN IMMERSIVE AND IN THE ROUND PRODUCTION OF TOM CIPPULO'S GLORY DENIED. OTHER UPCOMING PROJECTS INCLUDE THE COLLEGIATE PREMIER OF ELIZABETH CREE AT LOUISIANA STATE UNIVERSITY, KISS ME KATE WITH SIMPSON COLLEGE, THE MAGIC FLUTE WITH OPERA IOWA AND BON APPETIT WITH DES MOINES METRO OPERA. ADAM WAS BORN IN ROYAL OAK, MI AND ATTENDED WAYNE STATE UNIVERSITY IN DETROIT, MICHIGAN.